Murder by Gaslight: More Scenes from the Burdell Murder. 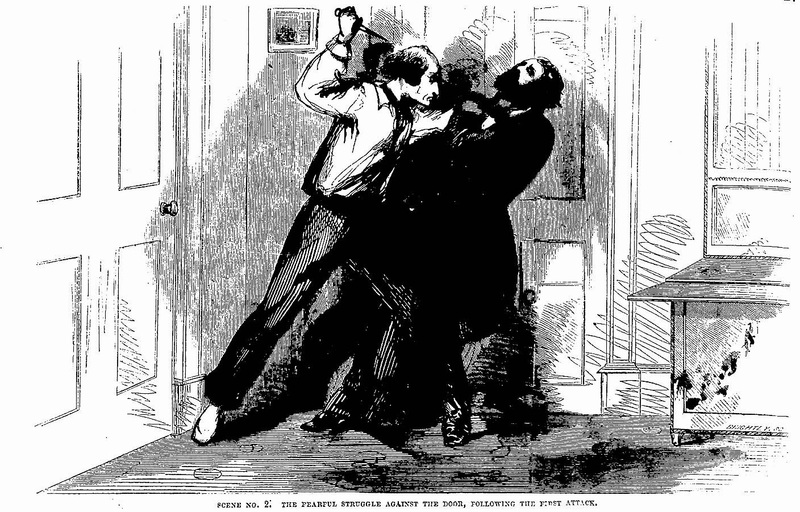 The 1857 stabbing of Dr. Harvey Burdell, one of New York City’s most sensational murders, occurred just in time to save Frank Leslie’s Illustrated Newspaper from bankruptcy. The weekly paper featured lurid illustrations from the murder in several issues and sold enough copies to keep the paper afloat. 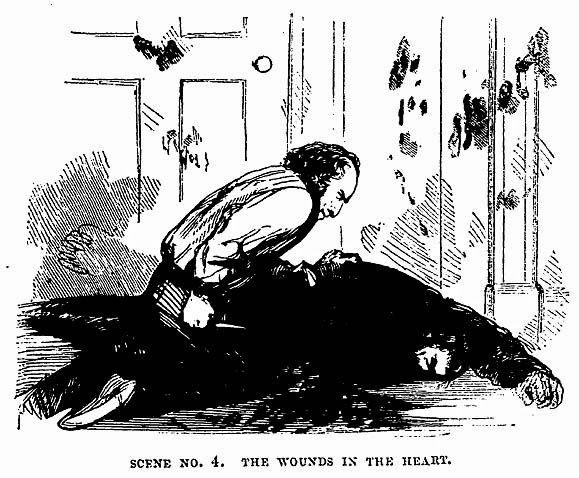 Murder by Gaslight has already posted the story of the Burdell murder (The Bond Street Tragedy) as well as a collection of illustrations from Frank Leslie’s Illustrated Newspaper (Scenes form the Burdell Murder). This set of illustrations portrays the murder itself, as theorized by the post-mortem physicians. The paper came out shortly after the lengthy inquest which indicted Emma Cunningham and John Eckel for the murder of Harvey Burdell. In the pictures the assassin is depicted as a man but he does not resemble John Eckel. Scene No.1. The assassin approached from behind as Burdell sat at his writing desk. 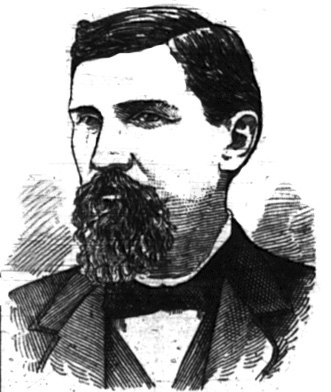 He stabbed over Burdell’s right shoulder and plunged the dagger into his chest, leaving a considerable amount of blood on the floor near the chair. Scene No. 2. The attack was, no doubt, shocking but the wound did not kill. 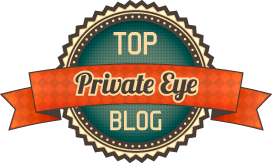 He rose from his seat and tried to fight off his assailant who then severed Burdel’s carotid artery. Blood spurted from this wound, leaving bloodstains on the wall. Scene No. 3. The murderer continued stabbing Burdell in the body before letting him drop to the floor. Scene No. 4. 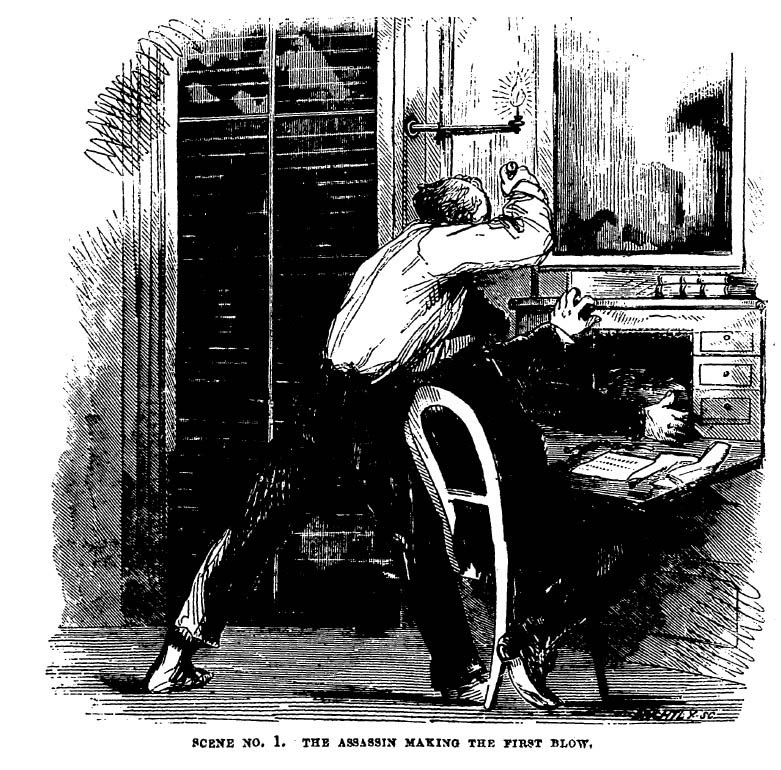 To finish his work, the killer plunged the dagger into Burdell’s heart. 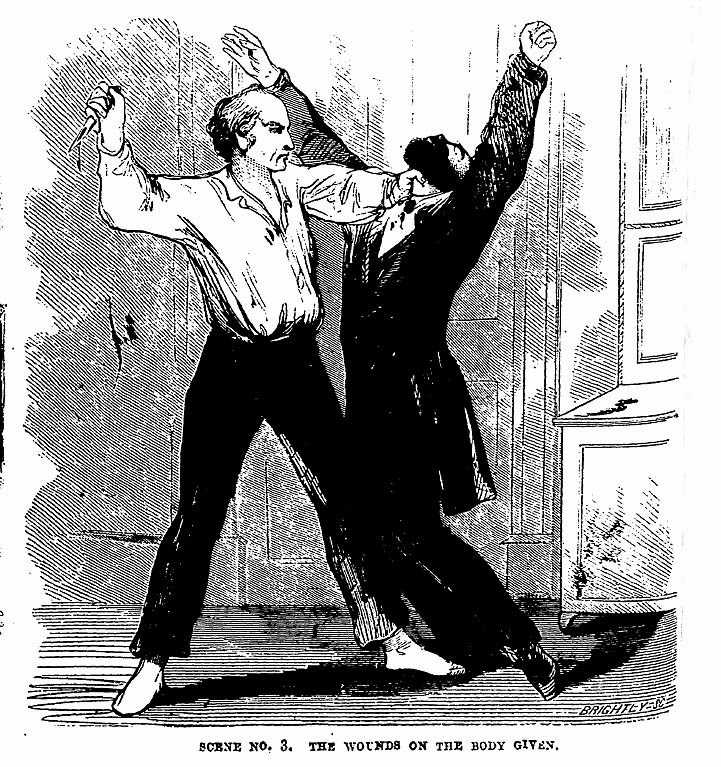 "The Supposed Manner of the Murder of Dr. Burdell", Frank Leslie's Illustrated Newspaper, February, 28, 1857.